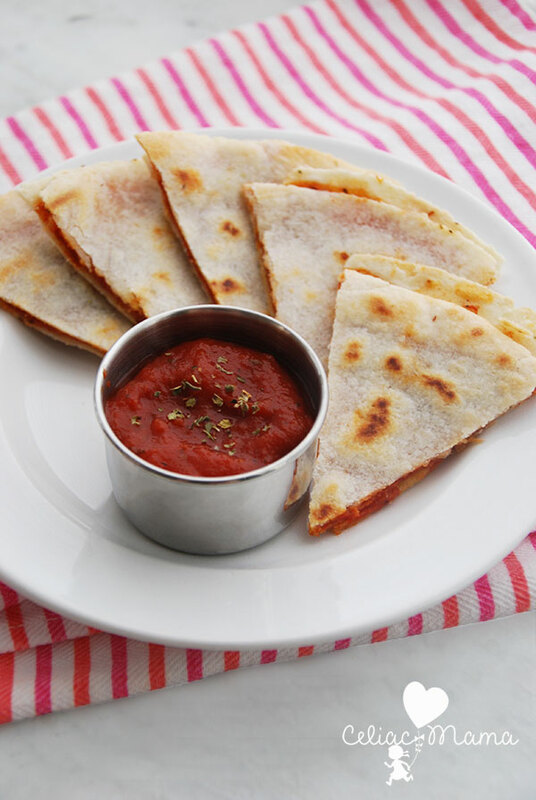 Gluten Free Pizza Quesadillas are a fun twist on traditional pizza that the whole family will enjoy and have fun making together! When I was a kid (which was not all that long ago I think) I don’t remember having pizza at school every week. I loved pizza, so I would have been excited about it but it just didn’t come up very often. Nowadays though, I hear about Pizza Friday’s all the time – at school and even at Summer camp. Pizza Friday’s are exciting to most kids, but it’s been one of the days where my daughter feels most different at school as most of the kids are eating from the same boxes of pizza the school ordered. Feeling left out is not fun, so I’ve been working on new twists on pizza to help her look forward to Pizza Friday’s. 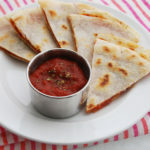 We recently made Gluten Free Pizza Quesadillas and they were a big hit with my kids. Both my son and daughter enjoyed building their pizzas and it only took me 10 minutes to cook them, so it was a win win. For the cooking, I literally add it to a pan on the stove for 5 minutes, flip and cook for 5 more minutes. 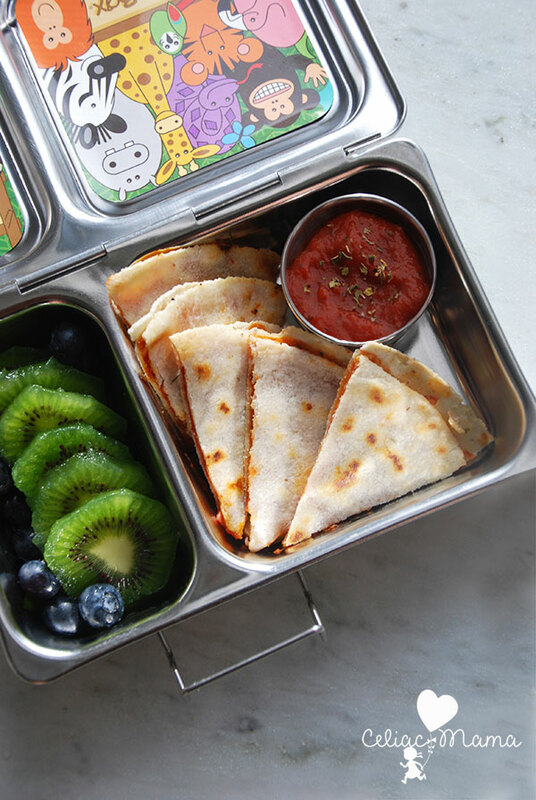 It’s so easy that I can prepare the rest of their lunch box foods at the same time, which is such a time saver. Here’s the simple recipe so you can make some too! This recipe is gluten free and dairy free. It makes 2 servings with 8 quesadillas, assuming you use small 5-6 inch diameter tortillas. This recipe is gluten free and dairy free. It makes eight quesadillas and serves two people. Preheat two pans on stove top on medium-low heat. If they are not non-stick pans, spray the pans or coat them lightly with olive oil. Place two of the tortillas face down on a cutting board. Cover the tortillas with pizza sauce. Arrange the turkey pepperoni on top of the sauce. 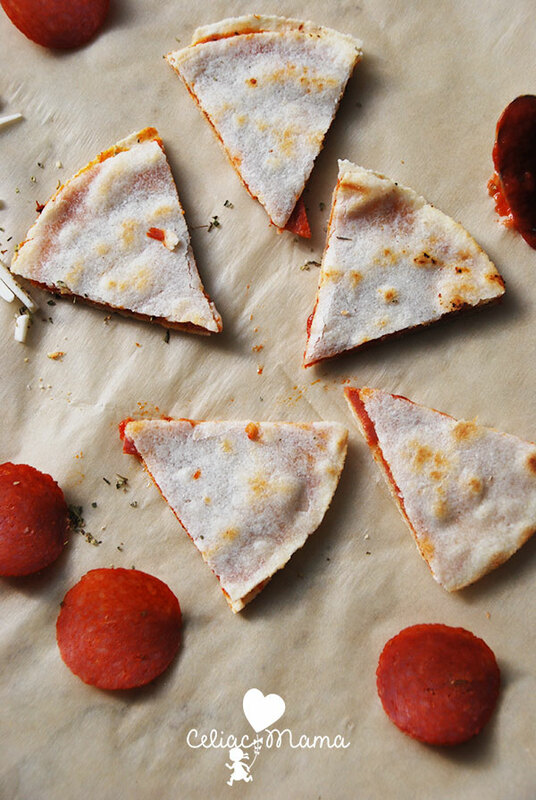 Sprinkle with your favorite dairy free mozzarella style cheese. Add the two left over tortillas on top of the others to form pizza quesadillas. Place the quesadillas in the pans and cook for 5 minutes. Flip and cook for an additional 5 minutes until both sides are light brown. Let them cool for 10 minutes and then slice them with a pizza cutter. Optional: Serve with a side of pizza sauce for dipping. Enjoy right away or send them to school in a lunch box. I used small gluten free tortillas, 5-6 inches in diameter, so if you're using large tortillas then you'll need to increase the sauce, cheese and pepperoni accordingly and it will make more servings.